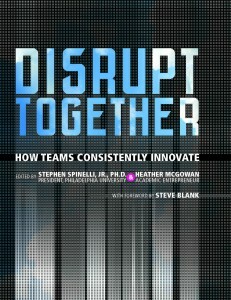 Philadelphia University President Stephen Spinelli Jr., an entrepreneurship expert, and former Assistant Provost Heather McGowan have co-authored the new book “Disrupt Together: How Teams Consistently Innovate,” which details effective team-based approaches to achieving innovation in business, education and other industries in disruption. The book, which will be released today, is on Amazon’s top 10 list of “hot new releases” in the market research business category and includes chapters by 14 additional disrupters from business and education who provide keen insights on key aspects of innovation. The book uses Philadelphia University’s award-winning Kanbar College of Design, Engineering and Commerce curriculum as the model for teaching innovation through transdisciplinary, collaborative teamwork and is based on design-thinking principles and opportunity-seeking behavior. “At Philadelphia University, we pioneered an international model for teaching and achieving innovation throughout the curriculum, particularly in the Kanbar College of Design, Education and Commerce,” said Spinelli, a well-known expert on entrepreneurship, co-founder of Jiffy Lube and former leader of Babson College’s world-renowned entrepreneurship program. The book has been praised by industry professionals and recognized as an invaluable resource for professionals in industries in transition, providing extensive new tools for educating an increasingly transdisciplinary work force and highlighting the competitive business advantage gained through this approach. As co-authors and co-editors, Spinelli and McGowan also present the visions of other highly regarded experts, including Philadelphia University faculty and administrators Geoffrey Cromarty, Ph.D., vice president and chief operating officer; Tod Corlett, director, M.S. in Industrial Design Program; Natalie Nixon, Ph.D., director, Strategic Design MBA Program; and D.R. Widder, vice president for innovation. Other respected innovation leaders who contributed to the book include Ellen di Resta, founder, Synaptics Group; Sara Beckman, Ph.D., chief learning officer, Jacobs Institute of Design Innovation, University of California, Berkeley; Sarah Singer-Nourie, founder, Singer Learning Inc.; Sarah Rottenberg, associate director, Integrated Product Design Master’s Program, University of Pennsylvania; Nabil Harfoush, Ph.D., director, Strategic Innovation Lab, OCAD University; David Charron, senior fellow and lecturer in entrepreneurship, Haas School of Business, UC-Berkeley; Yvonne Lin, co-founder, 4B; James Stahl, M.D., M.P.H., senior researcher, Massachusetts General Hospital; Brandy Fowler, associate director, Smart Design; and Maryann Finiw, senior manager, SapientNitro. Visit President Spinelli’s blog to read more.